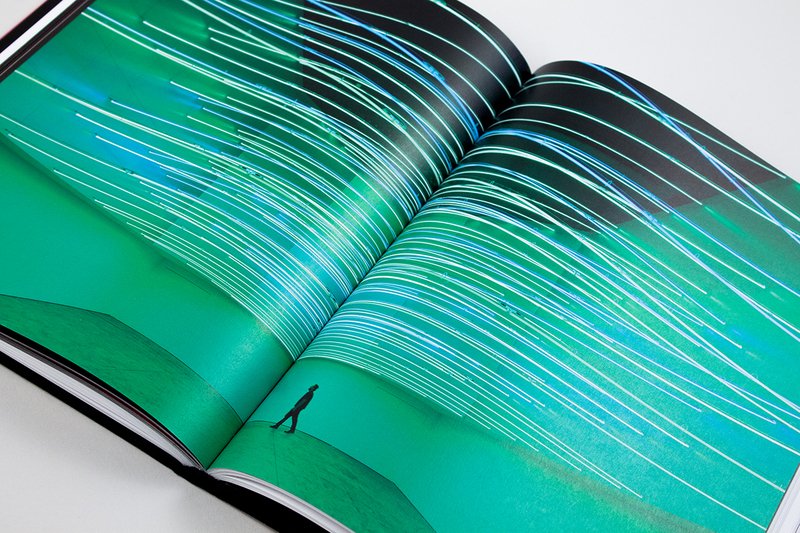 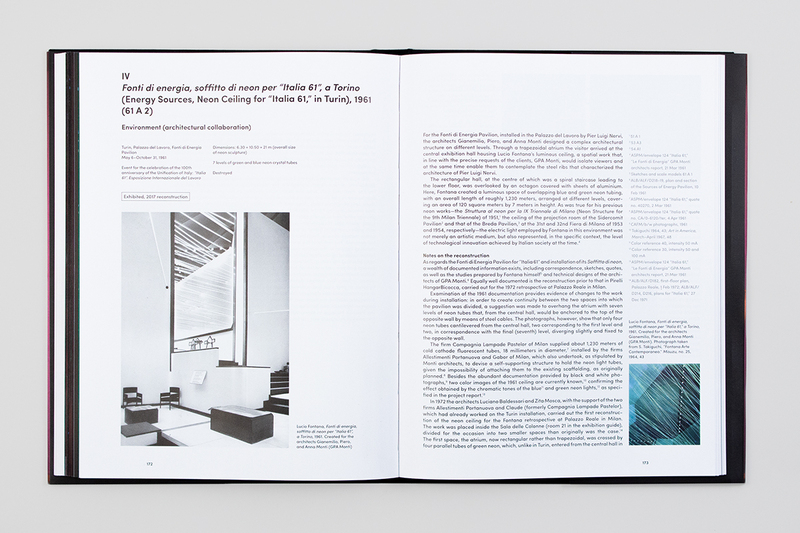 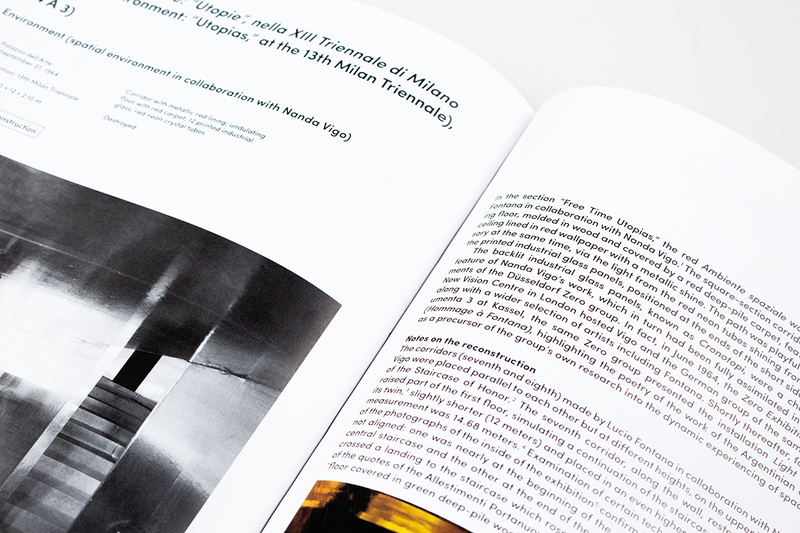 This publication is produced in conjunction with Ambienti/Environments, held at Pirelli HangarBicocca from September 2017 to January 2018. 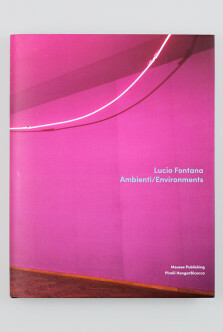 Focused on Lucio Fontana’s pioneering work in the realm of installation art, the exhibition presented a selection of his most experimental yet least-known works, Ambienti spaziali (Spatial Environments), seen together for the first time. 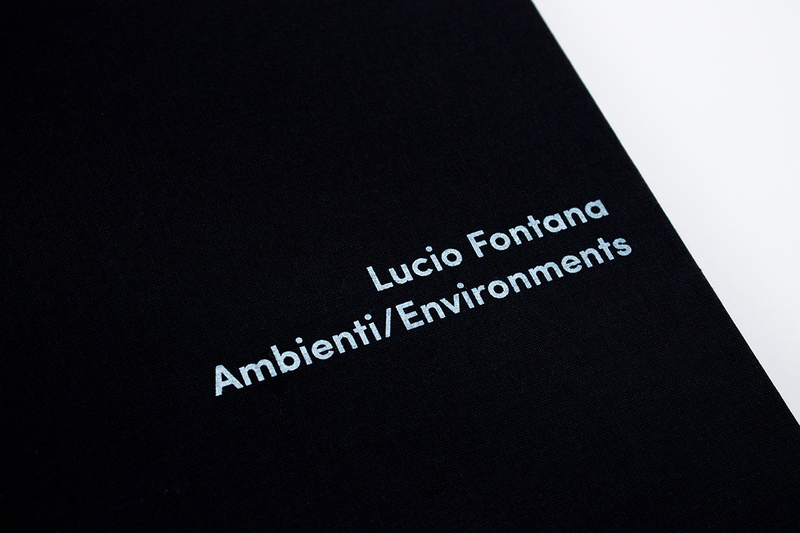 Fontana’s environments, conceived before the famous “holes” (Concetti spaziali), were revolutionary for their time for their use of innovative materials such as neon and Wood’s lamps and they anticipated the research on light and space that would develop in the following decades. 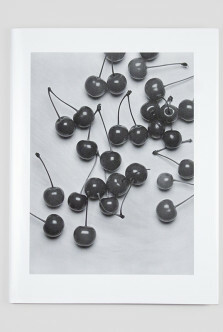 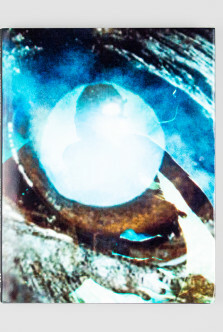 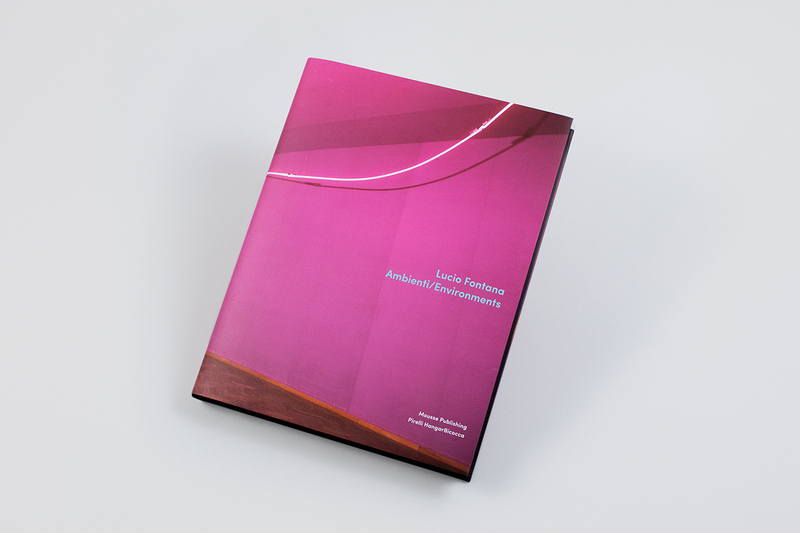 But the endeavor also has contemporary relevance inasmuch as Fontana’s research touches on several aspects of relational aesthetics, and is connected to contemporary practices of an environmental character, such as those of Anish Kapoor, Olafur Eliasson, or Tomás Saraceno. 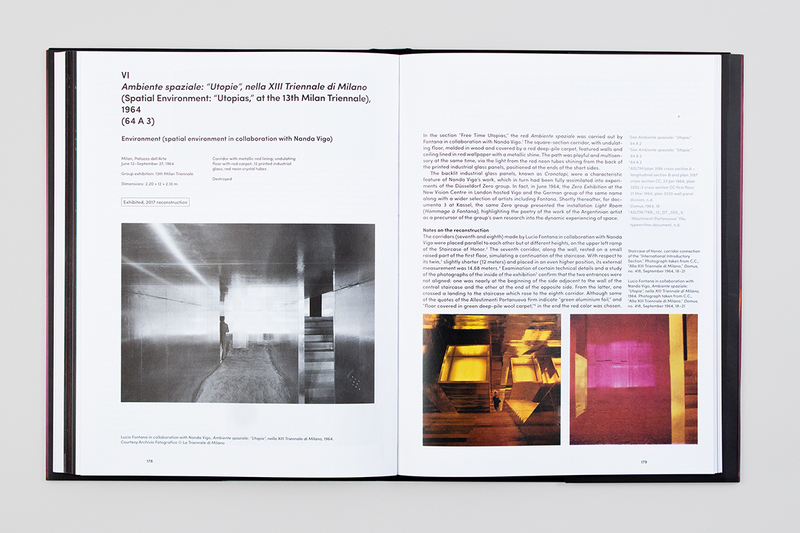 The exhibition was the result of long and in-depth study in several museums and private archives carried out by the co-curators, the art historian Marina Pugliese and the art conservator Barbara Ferriani. 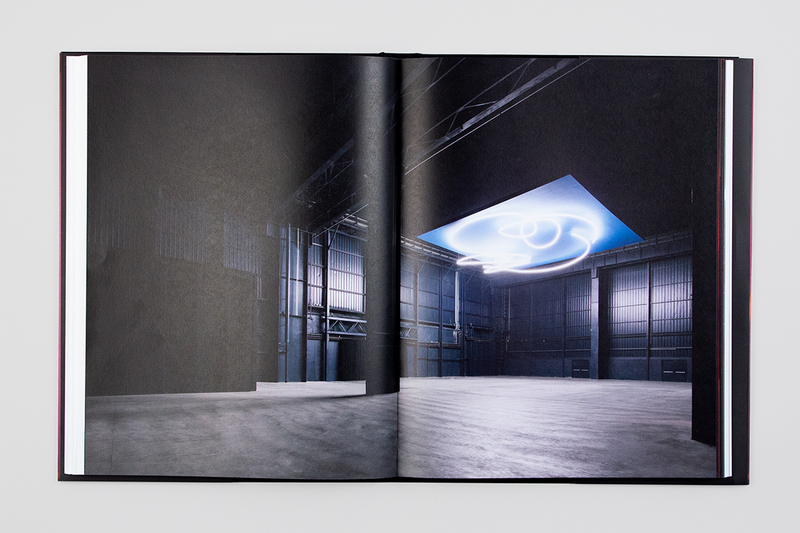 Some of the environments were reconstructed for the first time since the artist’s death, in collaboration with Fondazione Lucio Fontana. 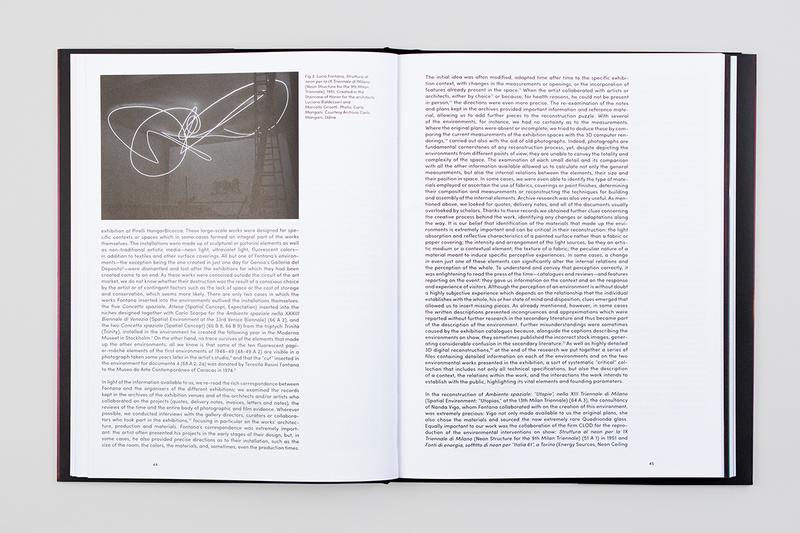 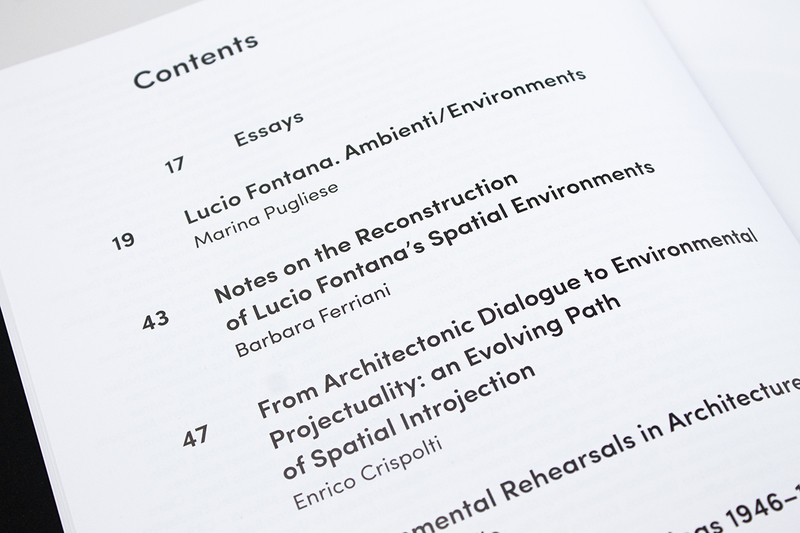 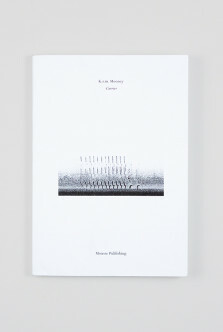 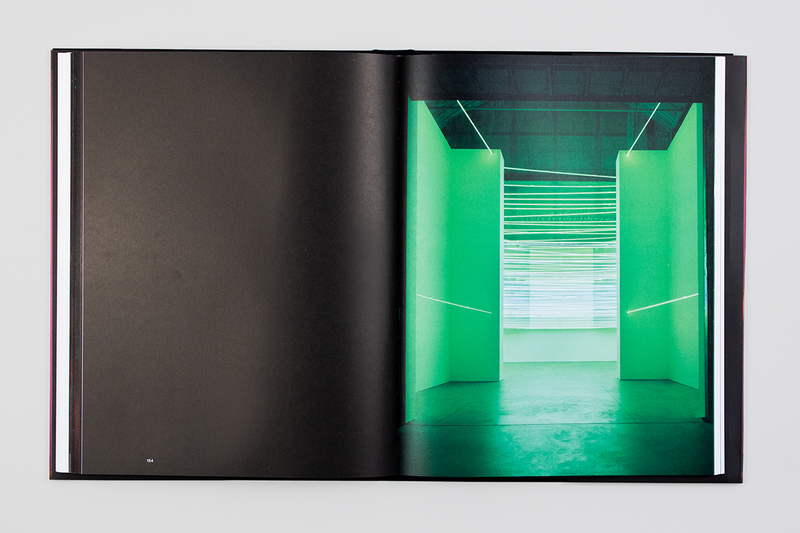 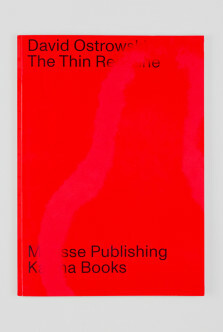 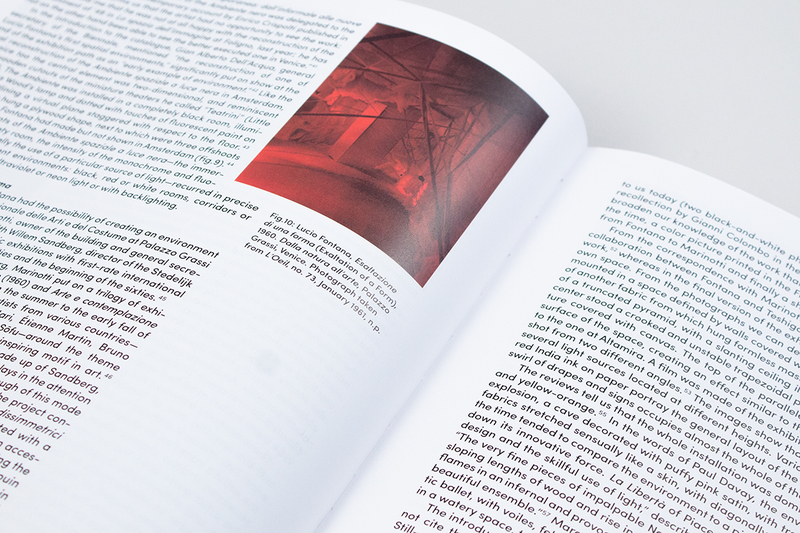 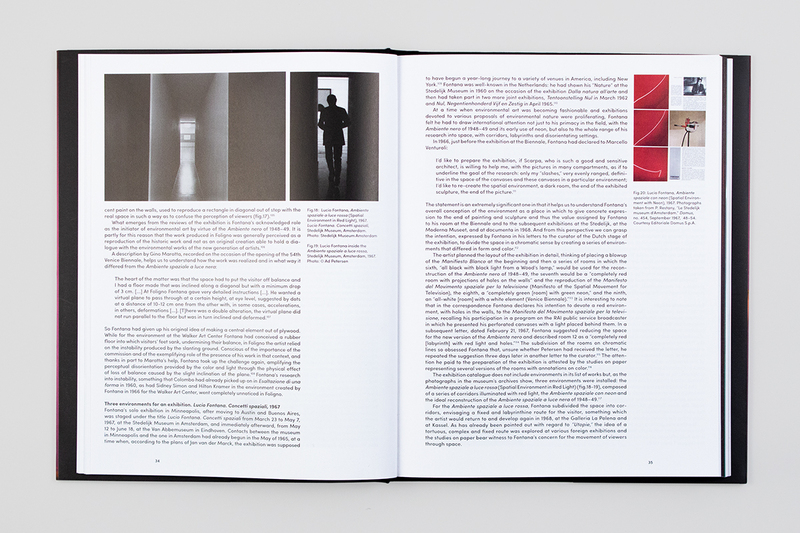 The book collects the most up-to-date research on this body of Fontana’s work and will prove useful for any future investigation of the spatial environments, as well as meeting the need for a new and critical look at the historical and artistic period in which they were conceived. 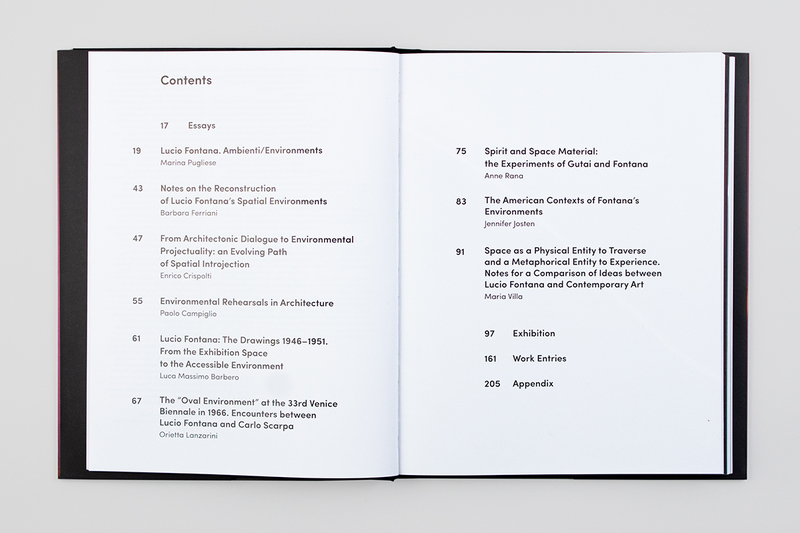 A detailed collection of work entries dedicated to the entirety of Fontana’s environmental production accompanies an extensive selection of essays, historical images, and installation views. 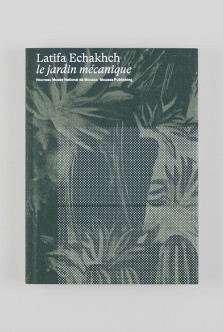 Marina Pugliese, Barbara Ferriani, and Vicente Todolí, eds.